Qualcomm made some pretty big news this week by announcing that the Centriq 2400 series is now shipping. This ARM-based server processor is the first 10nm data-center processor released by any company and is said to be able to compete with rival Intel Xeon processors when it comes to performance, energy efficiency and cost. Impressive claims in a lucrative market worth over $15 billion today and that number will rise to $20 billion by 2020. 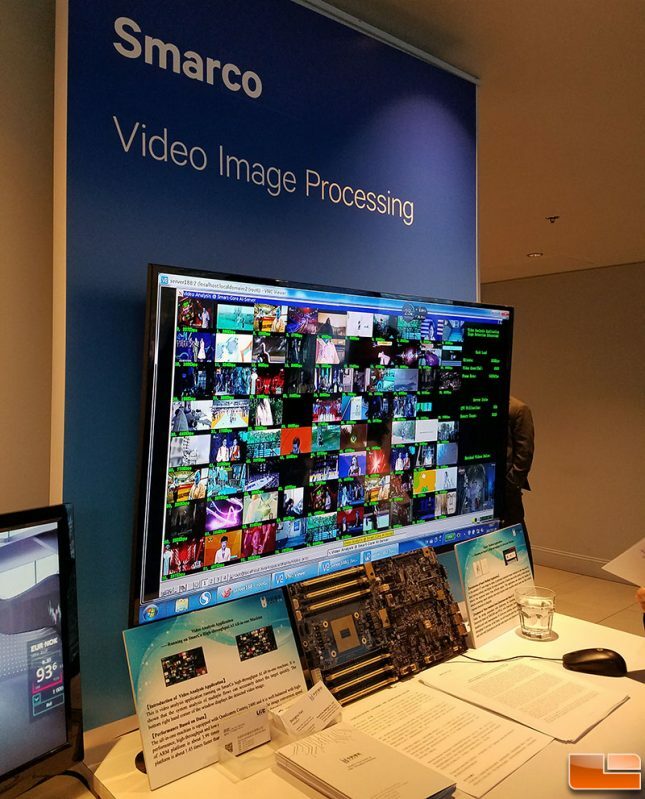 Qualcomm went with the ARMv8 64-bit architecture for the Centriq 2400 series and tapped Samsung to manufacture them on the 10nm FinFET process node. 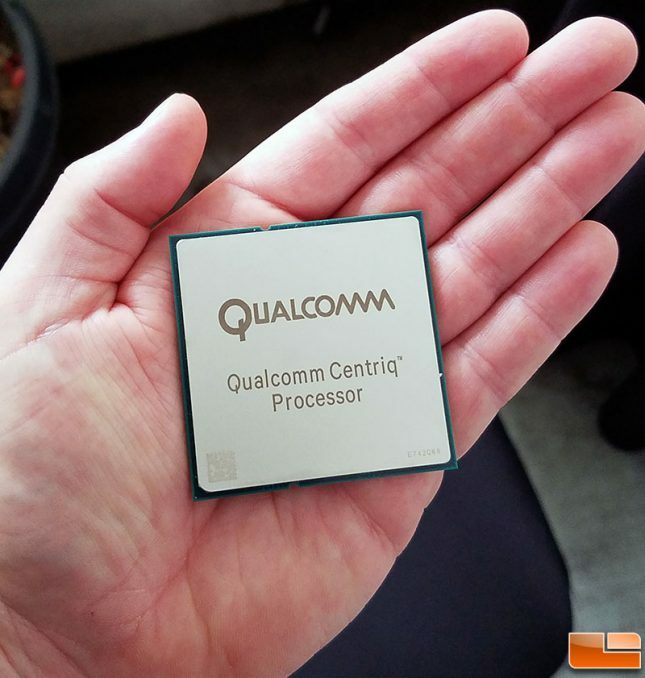 Qualcomm has pulled out all the 32-bit support from this processor as server workloads have been mainly 64-bit for more than a decade and Qualcomm wanted Centriq to be as efficient as possible. The end result is a disruptive processor series that has up to 48 physical cores, up to 60 MB of L3 cache, 32 PCIe lanes, 6-channel DDR4 2667MHz memory support and a power draw of up to just 120 Watts. 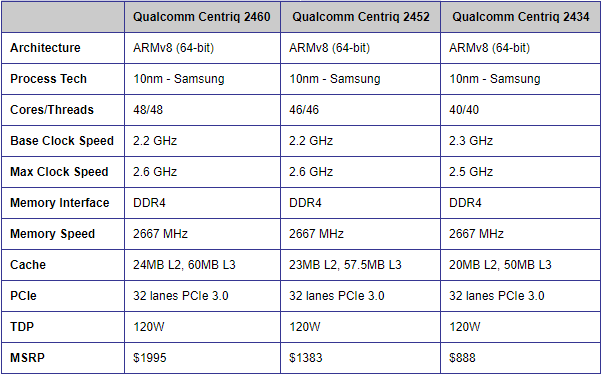 Three Qualcomm Centriq 2400 processors have been introduced into the market. On the top of the product stack you have the Centriq 2460 that has 48-cores clocked at 2.2 GHz on the base clock with a 2.6 GHz peak for $1,995. Stepping down from there you have the Centriq 2453 46-core processor with the same clock speeds and slightly less cache at $1,383. Lastly, the entry level processor is the Centriq 2434 24-core processor that is clocked at 2.3GHz base and 2.5GHz peak for $888. This is an interesting part that has a higher base clock than the others with 40-cores still enabled for under $900! These prices points set by Qualcomm are exciting as Intel demands a high price for their server parts. For example, the Intel Xeon Platinum 8180 has a staggering MSRP of $10,009. Qualcomm Is hopeful that the Centriq 2400 processors will shake up the server market where Intel gets most of the sales. Actually, that is an understatement as Intel has 99% market share in the data center. To get sales you need to have a good part and Qualcomm believes they have a winner with the Centriq 2400. Qualcomm shared some performance numbers with us yesterday and they look pretty good. Qualcomm used SPECint results that had the Centriq 2460 (48-core, 48-thread) performing seven percent better than the Intel Xeon Platinum processor (24 core, 48 threads) in SPECint_rate2006 and 13% better in SPECfp_rate2006. Qualcomm then showed price versus performance leadership on SPECint_rate2006 (using icc to gcc -o2 scale factor) versus comparable Intel Xeon Platinum, Gold and Silver processors. You can see what Qualcomm considers the competition in the slide above. The performance per thread results look solid as Qualcomm shows they have parity with the Centriq 2460 120W 40-core, 48-thread processor versus Intel’s behemoth Xeon Platinum 8180 205W 28-core, 56-thread part. When you look at the Centriq 2452 versus the Intel Xeon Gold 6152 they found they are eight percent faster and on the Centriq 2434 thy are 31% better than the Intel Xeon Silver 4116. Qualcomm did not offer any comparisons to the AMD EPYC processor series that was released earlier this year. The performance numbers look good, but what about power measurements? There is only so much floor and rack space available in data centers, so how does this single-socket platform compete on energy efficiency? Qualcomm shows they dominate the performance per Watt battle. Not too shocking as they have decades of power optimizations on the mobile front and some of that expertise is capable of being carried over since Centriq 2400 processors are ARM based. Qualcomm believes they are the winner when it comes to performance per Watt and performance per dollar. 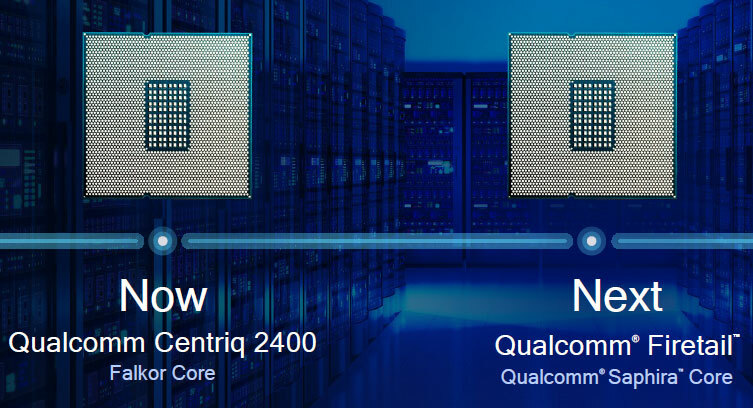 Qualcomm shows that the 48-core Centriq 2460 processor at $1,995 offers over 4x the performance per dollar over the Intel Xeon Platinum 8180 and that should get the attention of anyone that works in a data center. This is a shot inside a server by the Open19 Foundation, which is a group that wants an open platofrm that can fit any 19″ rack environment. You can see the silver heatsink covering the single Qualcomm Centriq processor that is flanked by two sets of 6-channel DDR4 2667MHz memory kits. Qualcomm has sent out Centriq samples to customers like Alibaba, LinkedIn, Cloudflare, American Megatrends Inc., Arm, Cadence Design Systems, Canonical, Chelsio Communications, Excelero, Hewlett Packard Enterprise, Illumina, MariaDB, Mellanox, Microsoft Azure, MongoDB, Netronome, Red Hat, ScyllaDB, 6WIND, Samsung, Smarco, Solarflare, Smartcore, SUSE, Uber, and Xilinx among others. It will be interesting to see their performance numbers now that they can be talked about! Qualcomm also announced that Centriq is just the beginning and that they are already working on the Firetail server processor that feature cores codenamed Saphira. The bottom line here is that Qualcomm Centriq 2400 processors with the new Falkor cores look impressive. 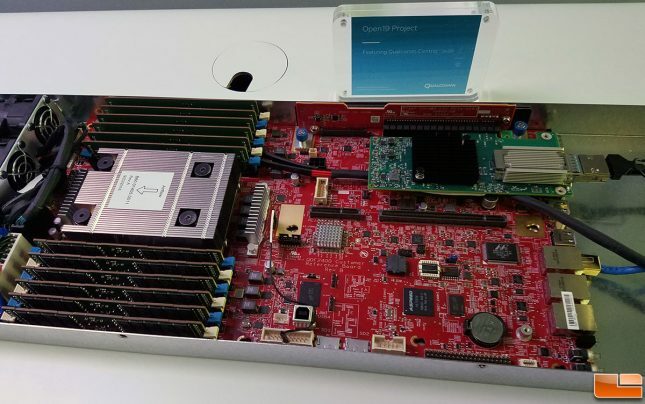 This is unlike any ARM based server processor that we’ve ever seen before and the core for core performance metrics against Intel’s offerings look very competitive. Keep an eye out on Qualcomm and what they are doing in the server market!